Southport & Ainsdale Golf Club hosted the 1933 and 1937 Ryder Cup matches between the USA and Great Britain. Team Captains in 1933 were Walter Hagen (US) and J.H. Taylor (GB). It was an exciting contest in 1933, which went down to the very last match between Easterbrook and Shute and it turned out to be a putting contest on the final green. Shute had a four-footer for the USA to retain the Ryder Cup, but he missed. GB 6 ½ - USA 5 ½. The 1935 Ryder Cup was played at Ridgewood. Team Captains in 1937 were Ben Hogan (US) and Henry Cotton (GB). Despite unpleasant weather, the first US victory was achieved on British soil thanks to fine performances from rookies Byron Nelson and Ed Dudley. USA 8 - GB 4. After a 10-year gap due to World War II, the next Ryder Cup was played at Portland in 1947. Only the Belfry has hosted more home soil Ryder Cups than Southport & Ainsdale Golf Club. But everybody flocks to play S&A’s royal neighbour, Birkdale. If only they knew what they were missing a couple of miles down the road. Southport & Ainsdale Golf Club was originally founded in 1907. At that time, golf was played across a stretch of links land between the railway line and the main Liverpool road. In 1922, the council decided to build another road into Southport and they decided to route it across the links, splitting the course in two. Fortunately, some new land was identified and James Braid, the greatest golf course revisionist of all time, was called in to sort things out. By 1924, Braid had built six new holes and updated the remaining twelve. So, in the scheme of things, Southport & Ainsdale is a relative youngster and it is set amongst exhilarating dunes and tangly heather. S&A has a very natural feel to the layout, although it is somewhat old-fashioned with some blind drives and obscured approach shots. This is not your traditional out-and-back layout. In broad terms, the course is laid out in two loops, with holes 2 through to 6 forming the inner loop. The fairways wind their way through gaps and valleys between the dunes and many of the greens are raised on tricky-to-hold plateaux. S&A is a serious golfing test, the layout measures over 6,800 from the back tees with par set at 72 and from the yellow tees, the length drops to 6,396 yards, but the par also drops down to 71. There are many memorable holes at S&A and the 8th is a bunkerless par three, measuring 157 yards. The green is sited on a raised table and only the best tee shot will stay on the putting surface. The 16th, measuring 506 yards, plays directly into the prevailing wind and when the wind’s up, three solid strikes will be required to reach the green. 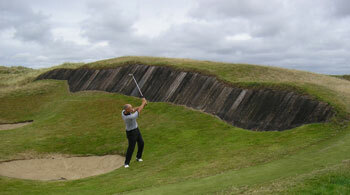 The hole is called “Gumbley’s” and it has a fine example of a sleeper-faced bunker. It’s a monster, set into the face of a large, tussocky sand ridge. Avoid this one like the plague. Southport & Ainsdale has hosted many important amateur events over the years and the good old Dunlop Southport and Swallow Penfold professional competitions were held here in the 1940s and 1950s with Max Faulkner, Fred Daly and Christy O’Connor emerging victorious. But S&A will be remembered for the 1933 and 1937 Ryder Cups. Britain won in 1933, but 1937 heralded the first American Ryder Cup victory on British soil, but it wasn’t their last because the USA retained the Ryder Cup for the next 20 years. Southport & Ainsdale should be played not only from a historic perspective but because this is a very natural and challenging links course, one of Braid’s finest seaside examples. It stands up remarkably well against its regal neighbours. Most people compare/contrast this outstanding golf course to nearby Hillside and Royal Birkdale – but I consider that a mistake. Review the course for what it is, and celebrate its own creation. Southport & Ainsdale starts with a very demanding 180-yard par 3 that has no less than 8 bunkers guarding the green. This opener grabs your attention and lets you know that this tight demanding course is no push over. A beautiful par 5 second hole gives you a glimpse of surrounding dunes, gorse and charming quirk that oozes around this property. While the topography is mostly flat with smaller dunes, the fairways have plenty of natural undulation as they navigate through what feels like a landmine of bunkers. The par 5 16th deservedly gets most of the attention with the famous sleeper cross-bunker that sits on a large dune and stares down at you. The second shot over this ‘Gumbley’ bunker requires a lot of courage and for first time players, this completely blind shot becomes one of the toughest shots on the course. Did you remember to buy a course guide? Southport & Ainsdale isn’t all just about two or three epic holes, but to its credit, you walk off the 18th green and say Wow, that was really superb! I thought the strength of the course was the many demanding par 4s that move in many directions, and constantly demand accuracy off the tee – most notably the last hole with its blind dog-leg tee shot into a hugely undulating fairway that could kick your ball into the thirsty bunkers. The tee shots are tight, and the greens are rarely on the same level of the fairway. Players will thoroughly enjoy the stretch of holes 4 through 8 and 15 through 18 which stood out to me as Braid’s better holes. I enjoyed how the course often required less than driver off the tee in many places in order to relentlessly position your ball to safety or the best spot for the approach. While the greens are relatively tame, there’s plenty of blind tee shots that will remind you that you’re on a serious championship course that has hosted the world’s best for the past century. When planning a trip to the “golf coast” of England, including Southport & Ainsdale is an absolute necessity. This James Braid masterpiece will quickly make you forget about its neighbours over the railway line. I was lucky enough to visit S&A on a trip to the open at Birkdale this year. As the 1st of 3 courses played on the fabled England's Golf Coast we were certainly treated to some wonderful golf. After 3.5/4 hours in the car the welcome at S&A was excellent, it had a lovely feel for a members club, a bag store to prop up your clubs and a terrace overlooking the putting green and 1st tee. The 1st piece of advice is to hit the range...I love a putting green, but with the 1st tee viewable from the clubhouse there is pressure from the off at 200+yds into a prevailing wind. A strong start, if not for me, its certainly a par 3 you want to play well with 9 bunkers to catch a shot not quite struck in the grooves. What follows is a lovely mix of links fairways, heather, gorse and strategic bunkering. My favourite of the 1st few holes is the par 4 5th, a strong hole which is great from tee to green. The hole narrows where you want your drive, and still have a long iron in, it felt great walking off with a par. If you are a strong driver of the ball you can score well round this course, but need to know your lines off the tees, there are a few dog-legs, but most of the shaping is subtle, with the line important on all of the 6th, 7th and 9th, 11th and 12th. If negotiated off the tee you still need strong approaches, but the tee shots are key, and set up a score especially on the par 5's. Interspersed in these holes are some lovely par 3's all requiring strong iron shots. The 8th perches on a hill, with anything short leaving a difficult pitch over the crest. The 10th a well bunkered hole after filling up at the halfway hut, and the 13th my favourite with a well shaped and sloped green. The run-in follows the trainline that separates S&A from Hillside, with accuracy and course management essential. Its a lovely run-in to a clubhouse backdrop, and you can just see a 'sunday finish' whether it be for a club champs, knock-out final or the Ryder Cup in the 30's. Definitely one to return to on a group trip. Southport & Ainsdale offers everything that the other famous links courses on this fabled stretch of Lancashire coastline can… and the golfing connoisseur would perhaps argue it delivers even more than this. As you might expect every facet of your game will truly be tested over this well-balanced James Braid creation. At a very firm and fast 6,836 yards (par 72) it isn’t the longest course on England’s Golf Coast, and there are several times when driver is not the club of choice from the tee, but the test is stern, true and most importantly engaging. One of the first things you will notice is that the fairways are littered with bunkers. Indeed my only real criticism of the links is that there are perhaps too many of them; often there are two, three or four pits in the same area when just one would do. Regardless, this makes driving a real challenge because the sand traps can be found on both sides of the fairway and at differing distances. As you might expect the shorter two-shotters on the course are protected more heavily with sand, however, there’s a little bit more leeway on the longer holes. From the tee you must also contend with several areas of gorse; sometimes it’s just the odd dab here and there but at others there are large areas of the prickly yellow shrub. Pleasingly a lot of this has been removed since my last visit a few years ago and this has really helped opened up the sight lines on many holes and they can now be seen it all their glory - the best and most telling example of this is at the 15th. Many of the holes are also lined with heather which makes finding the ball relatively easy but advancing it in the intended direction much more problematic. In terms of the various golf course rankings Southport & Ainsdale never seems to get a fair crack of the whip in my opinion. Although it regularly features in the usual top 100 lists it is often left in the wake of near neighbours Birkdale, Formby and Hillside. I’d personally put it on a par with the first two and ahead of the latter but why not make a visit here and decide for yourself. Very little to choose between S & A that makes the Top 100 list and Formby and West Lancs that do not reflecting the increasing competitiveness as new courses are built and older courses upgrading. More in the Hillside, Formby bracket with a mix of landscape design part links, part parkland, part heath. Favourite holes 1, 2, 3, 5, 6, 9, 14 and the epic 16th. Played S&A in June 2013 in one of the Open competitions – at £55 each, which included refreshments, it is fantastic value.Unlike many of the top rated clubs (S&A is 46th in England), the welcome here is fantastic from ALL the staff, especially the starter who was really helpful with a few tips. We were all category 2 or 3 handicappers, so thought we might find the course a bit tough. But the course is a really fair test of golf with accuracy rewarded – keep it straight and many of the greens are reachable with mid/short irons.There are some great holes: 1st is a tough par 3 with lots of punishing pot bunkers; 3rd has a great elevated tee, 4th short but looks fantastic off the tee with bunkers everywhere, then 15, 16, 17 & 18 are a great finish.This part of the word has some fantastic courses along a short stretch of coast. Having played them all, I would rank this course equal 2nd (1. Birkdale, 2.=S&A/Hillside, 4. Formby, 5. West Lancs). Hillside has a great back nine, but the front nine is weak and the overall golf experience not as good.We had a drink outside with some members at the end of the round who could not have been friendlier.Look forward to playing here again, even if we have to pay the full green fee. Birkdale is awesome – get a few mates together, pop £20 a month away, and treat yourself to an S&A/Birkdale double with a night over in Southport! Played this for the second time end of April (first in 2000) and I must say it was a lot better than I remembered. I’ve played all the courses in this great golfing neck of the woods and it is well worth a visit. It isn’t as tough as Birkdale or Hillside’s back 9 but is certainly on a par with West Lancs and Formby. There are a couple of blind shots (6th drive & 16th second shot to a Par 5) but that’s no bad thing. All the holes are different and I can picture most in my mind now (an acid test of a good course). I particularly loved the stretch 3 to 9 all great holes – with 4 being my favourite. The 10th probably the only weak hole but that’s probably because I 3-stabbed. The short 8th is also terrific. On balance I would say Hillside has the edge but only because of the back nine – both S&A nines being better than Hillside’s front. It was my father’s 80th birthday treat and he had a great day. Lovely clubhouse, great food and very friendly locals – plenty of cheeky scousers in the bar and we even got some inside gossip on “King Kenny”. S&A is a very nice course, no.3 in a town full of great golf. Not as good as Birkdale or Hillside, but still very good, would have it just behind West Lancs in my rankings. Not too many blind shots, as another review suggests, but the 6th and 18th tee shots are a bit of a lottery for a first timer. The 16th is the most famous hole but for me, best hole is the 5th, a difficult par 4 played between two dunes to a pretty green framed by pine trees.Would definitely go back, it's pretty good value for money. A fantastic golf course, played this week and the greens were like silk, for the end of March they were unbelievable, including the putting green. I disagree with regards to the blind shots, they are there to add to the adventure, theres the fantastic dog leg right 6th, obviously the gumbleys 16th second is blind, a very special par 5, and the 18th tee shot, but I cant remember too many more. There is a great variety of holes, pristine tees, fairways and bunkers, not forgetting the heather and pine trees, and the train line reminding you you are playing a links not that far from the coast. The clubhouse is friendly and relaxed, the pro and practice facilities excellent and the green fees reasonable for a course of this ilk. Its easy to fall in love with the place ! Afraid that I disagree with most reviews. My main problem is the number of blind shots that mean you don't really know where to aim. We were held up and it was very slow, called the pro shop but they were unable to get a marshall out. If you play there regularly probably fine and may be one that you need to play a few times. I think that Hillside is better, and Formby is better still. As a true links go to West Lancs. The greens at S&A are great, and general condition great, but too many blind shots.